The thing that sets this Caprese Salad apart from others? Toss with a simple garlic-herb vinaigrette first, then finish with a drizzle of balsamic for extra flavour and the signature finish. Looks great, tastes even better! Caprese Salad is terrific served as a side for sharing, as a light meal with crusty bread or piled onto toast with smashed avocado. Fresh and delightful! 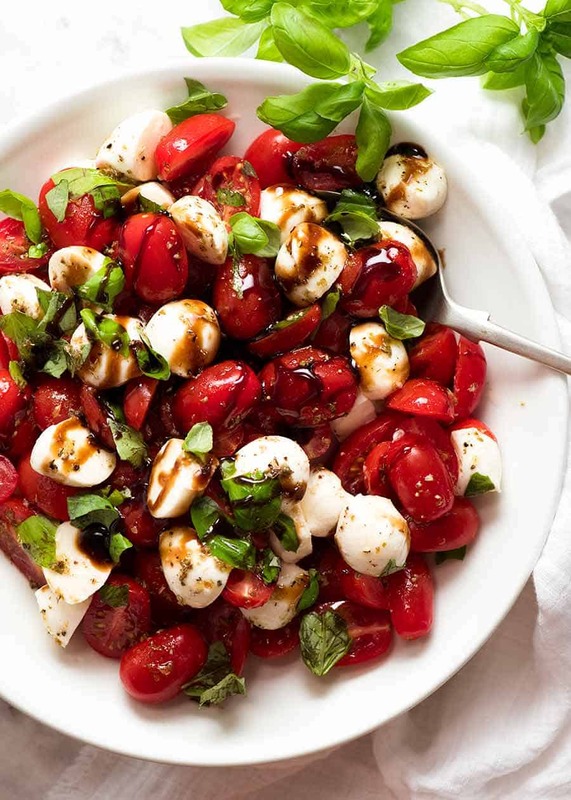 Everybody loves the idea of a Caprese Salad, but all too often it’s either rather bland because it’s just dressed with olive oil, or it looks like a terrible mess because it’s tossed with balsamic which stains the pearly baby mozzarella balls brown. So I make my Caprese Salad with a vinaigrette for the main dressing then drizzle it with a balsamic glaze for an extra burst burst of flavour just before serving. The Dressing that everybody thinks of as Caprese Salad Dressing is a balsamic glaze, also known as balsamic reduction. It has an intense sweet-tangy flavour so you do not need very much of it – just a drizzle – otherwise it will overwhelm the salad. So we need second Dressing for Caprese Salad to provide more flavour that we can toss through the whole salad before drizzling with the balsamic glaze. Many recipes just use plain olive oil, but I prefer to use a simple garlic-herb vinaigrette because it has more flavour, I like the look of the little specks and also, it’s healthier (less oil). While balsamic reduction is quite simple to make (see recipe here), I’ve used store bought here. It’s not that expensive, and it has a shelf life of years and years! 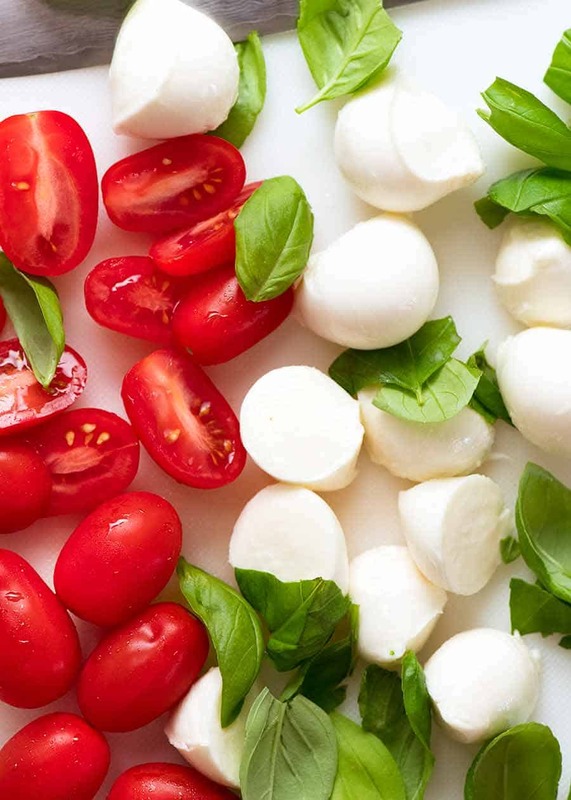 Caprese Salad is made with fresh mozzarella cheese. This is different to the mozzarella cheese you grate and sprinkle onto things to bake and melt. Fresh mozzarella is soft, and unlike most cheeses, it is not salty. It has a flavour similar to ricotta – though the texture is different. In this particular recipe, I have used baby mozzarella, also known as cherry mozzarella or bocconcini. They are just small fresh mozzarella balls. I like using small ones because they are similar in size to the cherry tomatoes. While most people just keep the bocconcini balls whole, I prefer to halve them so they are the same size as the halved cherry tomatoes. Better balance of tomato and mozzarella in each bite! This also makes the bocconcini go further – it’s a bit pricey, starting at about $5 for a 220g / 7.5oz tub, going up to $10. For a Caprese Salad served like this, I like to use a ratio of about 1:2 bocconcini to cherry tomatoes, by weight. I find this to be the best balance of juicy tomatoes to creamy mozzarella. Feel free to adjust to your taste! I’ve made this Caprese Salad as a side dish for sharing, rather than a single plate starter as it is often served at restaurants. But think beyond a side salad! I enjoying having Caprese Salad as light no-cook meals in the hotter months. The bocconcini gives it oomph, especially if you have a crusty roll on the side, so it’s quite satisfying as a meal. But my favourite way to serve this Caprese Salad is as bruschetta on toast. Smush up some avocado on toasted sourdough, then pile Caprese Salad on top. Breakfast, lunch or dinner. Steak! Grill these Marinated Steaks and serve this on the side with Crispy Smashed Potatoes. YUM, what a combo! A summer staple! 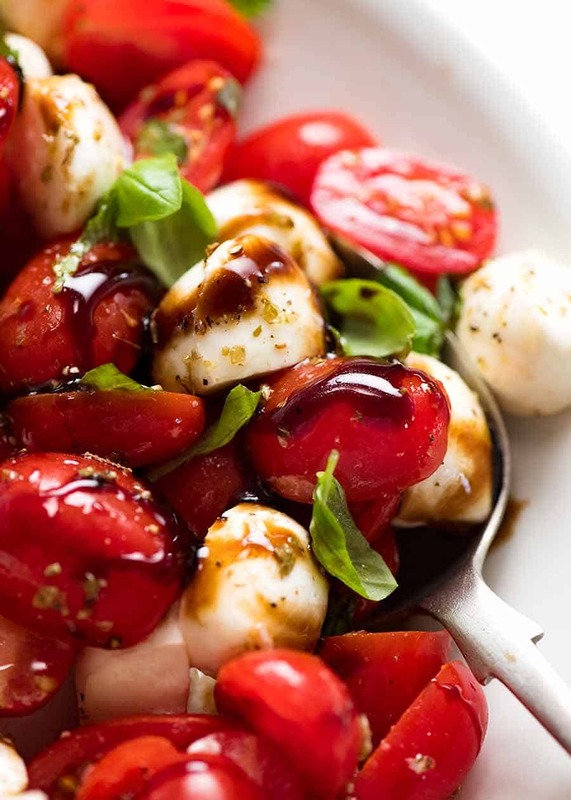 The thing that sets this Caprese Salad apart from the usual is that it’s tossed with a garlic-herb vinaigrette first then finished with a balsamic glaze. Keeps it looking “clean” with terrific flavour! Serve as a side, on toast with avocado or as a light meal with bread. Place Dressing ingredients in a jar and shake very well. Adjust to taste. Place tomatoes, bocconcini and most of the basil in a bowl. Drizzle over dressing, toss gently. Transfer to shallow serving bowl. Just before serving, drizzle with balsamic glaze and sprinkle with remaining basil. 1. 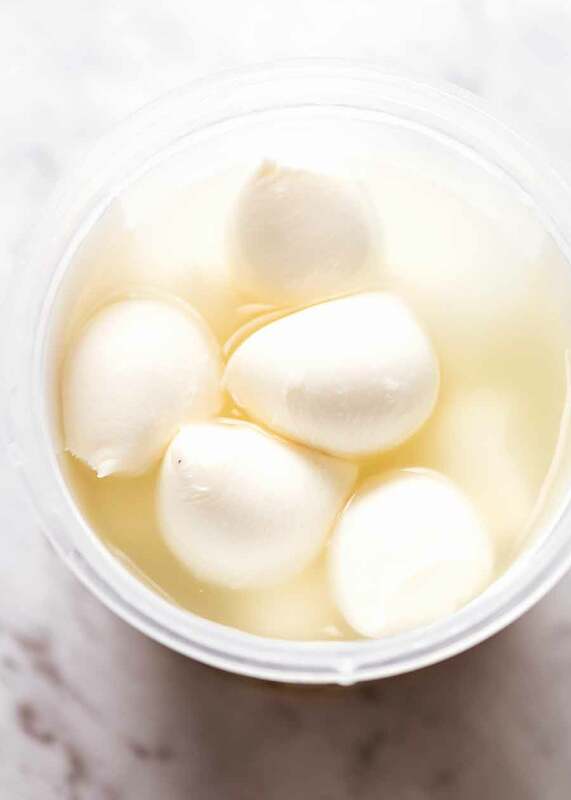 Bocconcini is fresh mozzarella. Also known as cherry or baby mozzarella. The balls are about the size of cherry tomatoes. 2. 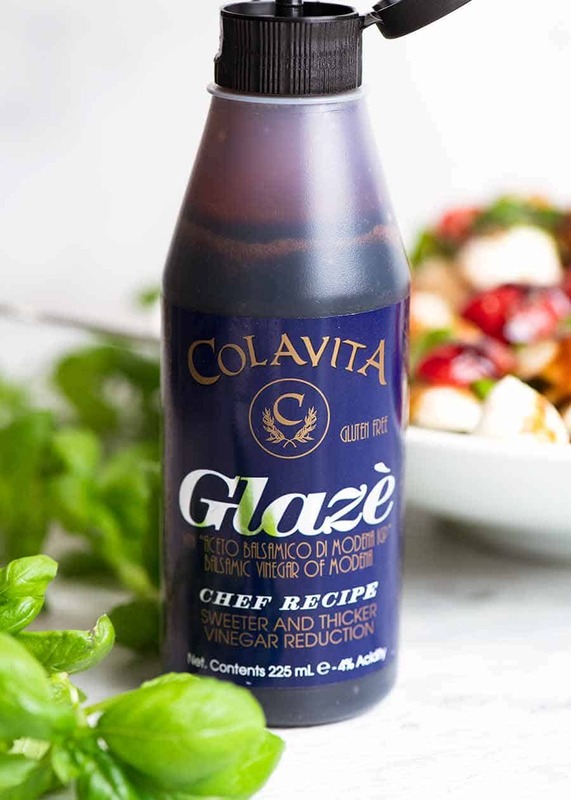 Balsamic Glaze – Balsamic vinegar and sugar simmered to reduce down to a syrup. Strong, intense flavour so just use it for drizzling. I’ve used store bought here, it’s sold alongside normal balsamic vinegar. 3. Vinegar – feel free to use any other clear vinegar, even white balsamic vinegar. Just taste and adjust dressing with more oil or vinegar if required. – I like to use a ratio of 1:2 bocconcini to cherry tomatoes. Feel free to use more bocconcini. – Best served freshly made. 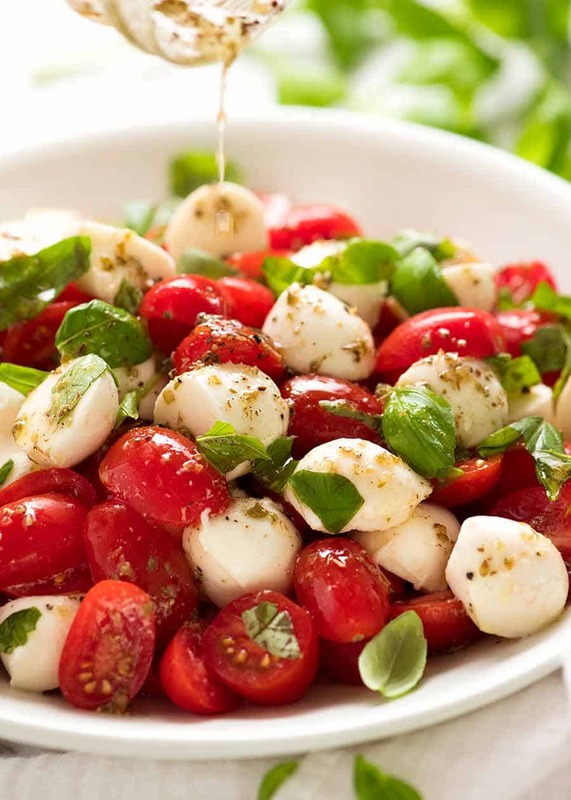 – To prepare ahead, chop tomato and bocconcini, make Dressing. Prepare basil leaves but do not tear – turns black. Then assemble just before serving. 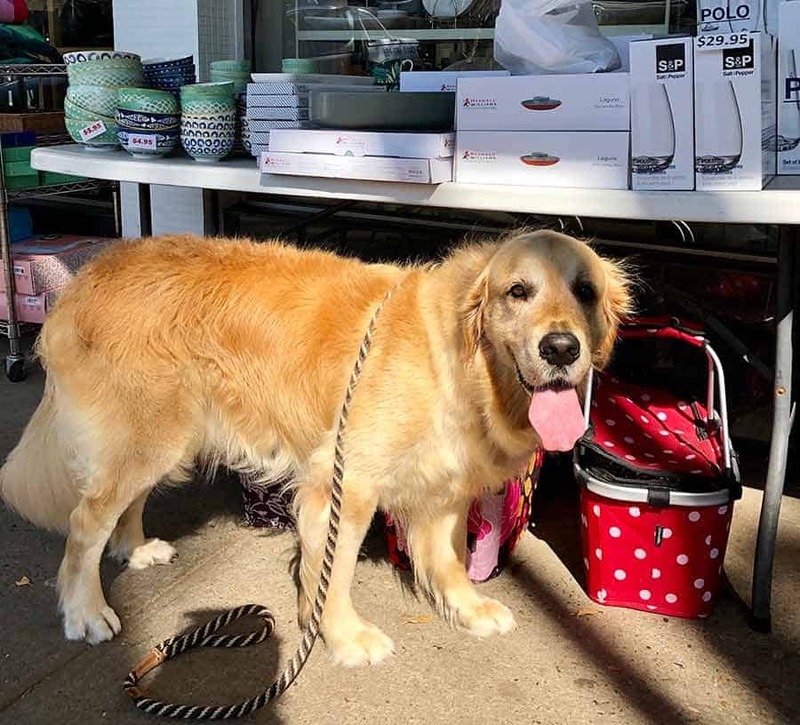 Outside a homewares store next to a table laden with breakables. Like a bull in a china store! 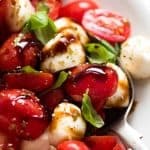 The post Caprese Salad appeared first on RecipeTin Eats.